Helplessness Blues could easily fall foul to “difficult second album” syndrome;Â to follow such a critically acclaimed eponymous debut was no doubt tough, butÂ somehow Robin Pecknold and co. have given us something every bit as poignantÂ as their previous offering whilst developing a style that is so atypical of thisÂ Seattle-based band. The vibe of the record is more orchestrated, yet no less organic than what weÂ have heard before â€“ a mature sound and more variation in style. If the advancesÂ in instrumentation don’t get the skeptics on board, the beyond poetic vocal lineÂ should. Album opener, “Montezuma,” utilizes the classic Fleet Foxes harmonies andÂ vaguely medieval lyricism in such a predictable way that some may write it off asÂ generic, but alas, this old world stereotype is what fans are looking for anyway. 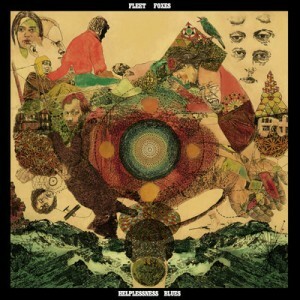 Title track “Helplessness Blues” is so close to perfect it’s scary -all the classicÂ Fleet Foxes accoutrements are there combined with a slightly ballad-like feelÂ from the song’s crescendo whilst â€˜The Shrine/An Argument” demonstrates theÂ versatility in writing; simple and more mellowed, yet no less memorable. “Blue Spotted Tail” is more minimal, though every bit as haunting, beggingÂ the question â€“ “why is life made only for to end?” Maybe we’ll find out in albumÂ number three â€“ great as this record is, no doubt the best is yet to come.